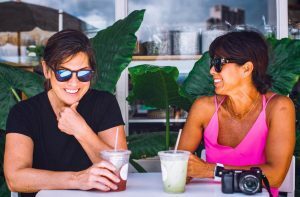 Our “talk story” narratives arise from our drive to know more about intriguing residents of Hawai’i, art and culture. The format is simple and casual – we meet face to face, pose a few straightforward questions, shoot some photos and document the conversation as it naturally evolves. Whatever cool thing we discover is available here for all that want to tune in and get the scoops too. 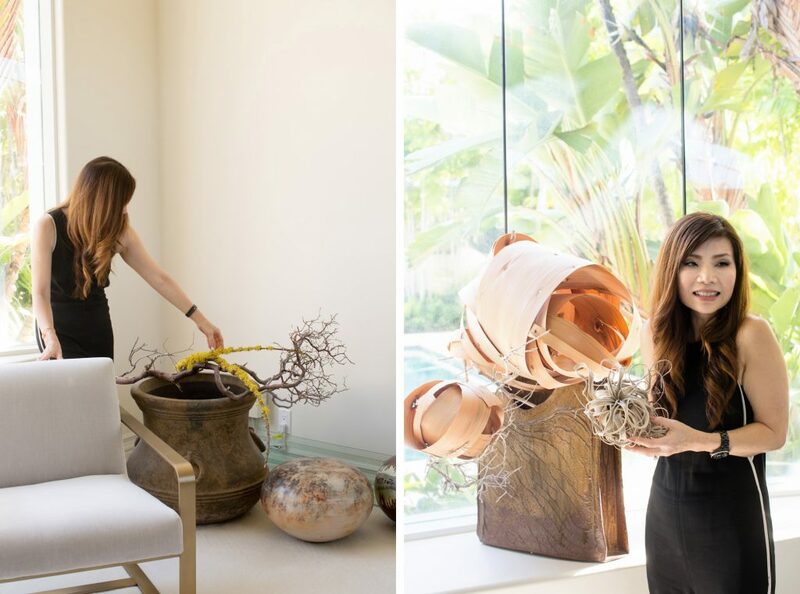 Debuting as a docent at the Contemporary Museum of Art nearly twenty years ago, Kristen Chan’s contribution to our community is immeasurable. A generous benefactor who also serves as Board Vice President for both the Honolulu Biennial Foundation (HBF) and the Hawai’i International Film Festival (HIFF), her quest is ensure our city offers not only our mountains & ocean but also art & culture to nourish our souls. We knew that writing about her would make her blush so we chose to write to her instead. With your son off to college, like many, you are electing to embrace a new chapter of life. Already immersed in organizing the annual Hawaii Film Festival and the 2019 Honolulu Biennial you’re also passionate about Ikebana Sogetsu which we knew nothing about. Your “talk story” about life, the importance of art and it’s profound impact resonated with us too. 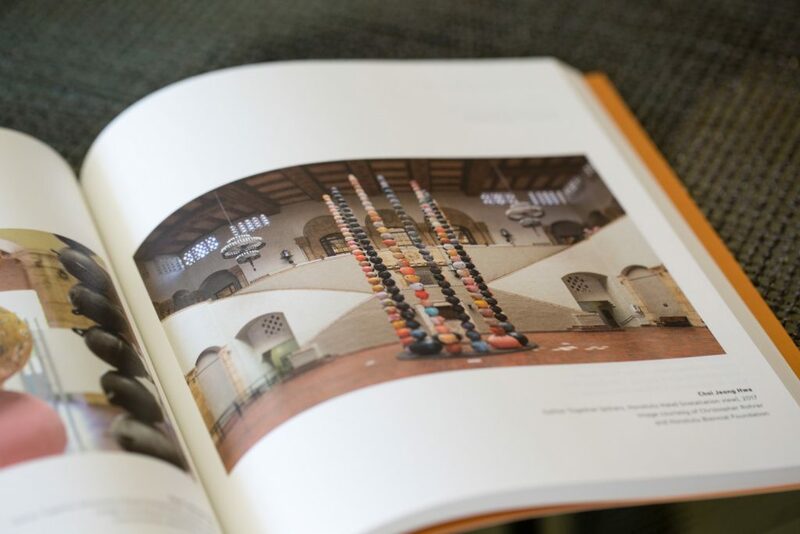 We agree, contemporary art does speak to our generation and we are touched that you shared so openly. 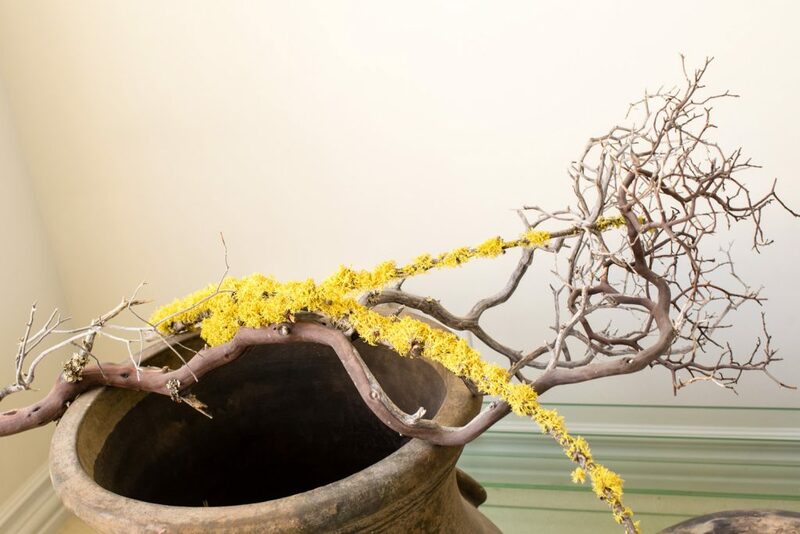 After our visit, we googled Ikebana Sogetsu and Choi Jeong Hwa, the artist who made the lei Chrissy photographed. Results on him confirmed that this Korean artist has “rock star” status. His reputation made it all the more impressive that he worked on site at Honolulu Hale. 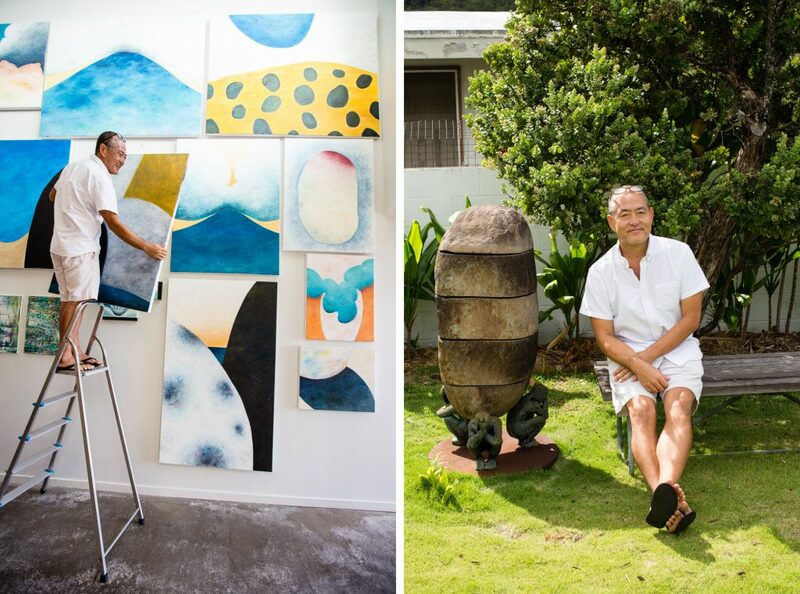 There he constructed the “Gather Together” installation for the inaugural 2017 Honolulu Biennial. This is where the back story on your unique lei began. We have a confession. 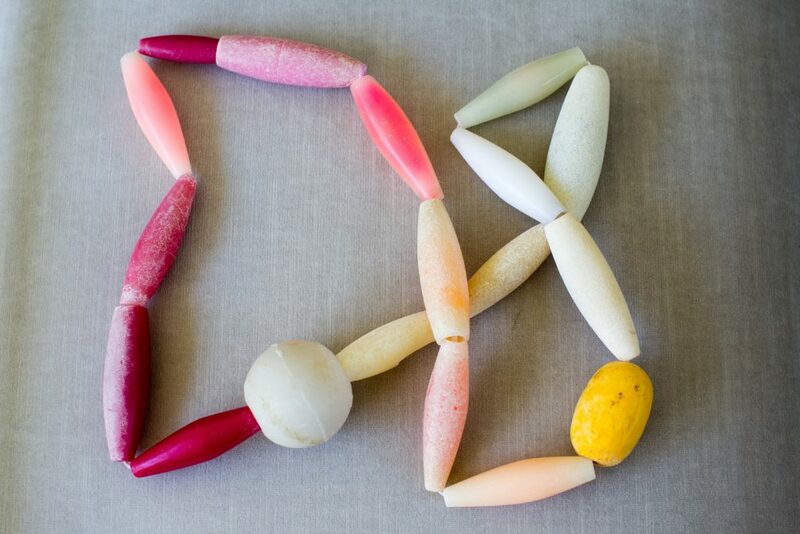 When you first put on Choi Jeong Hwa’s “lei” we only saw a lei constructed of colorful plastic objects. Thoughtfully, you slipped into “docent” mode to educate us and explained that the plastic objects were actually old fishing net floats that had washed up on our shores. That’s exactly what’s so cool about contemporary art – discovery. This artist was able to revive and transform floats littering our beach into an au courant lei – clever, environmentally friendly and gracious. 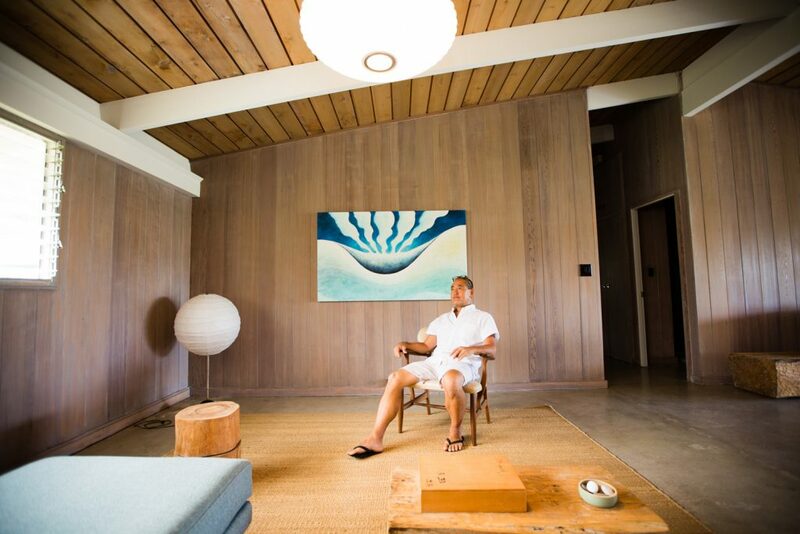 Thank you sensei – for helping us comprehend the reasons his lei is a treasure to you. While he presented it to you as a gesture of appreciation and respect, he also symbolically passed on a part of himself. 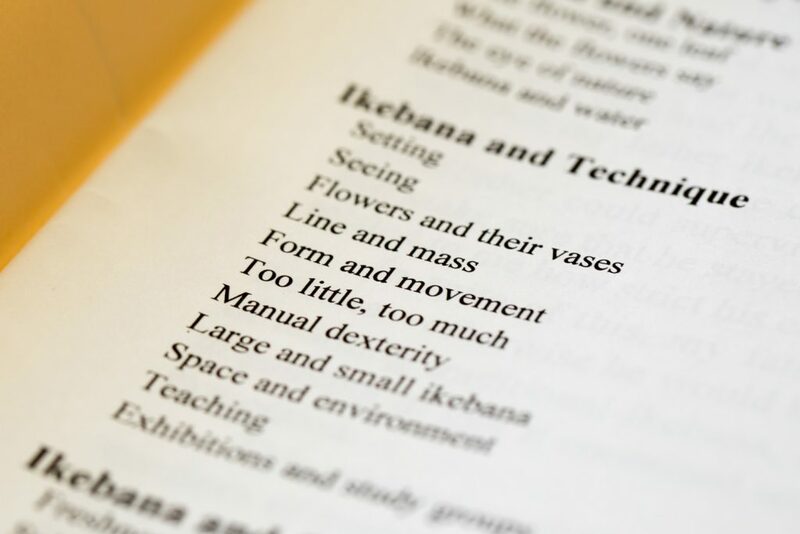 It’s the same with your Ikebana Sogetsu right? Just a hunch based on your enthusiasm and stunning arrangements. You have motivated us to learn more about this art and we are toying with the idea of becoming your students. Seishu, the name given by your sensei translates to gentle autumn. So Seishu – will you take us on? 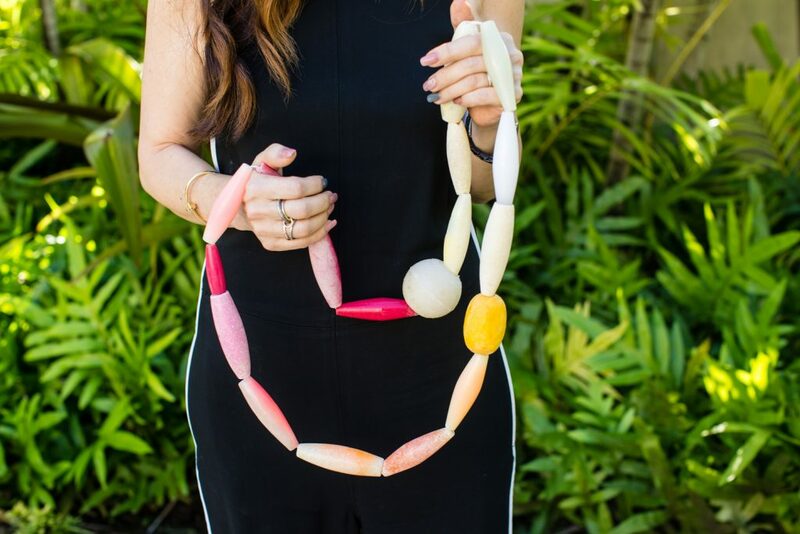 We’d like to experience the bliss and euphoria of seeking plant materials the way you do. We were left wondering if nature is the core of the “simplicity” of your arrangements? Let’s get together soon, ideally over flutes of champagne, to talk more about this & anything or everything else. You are animated, warm and engaging and we find you remarkable! 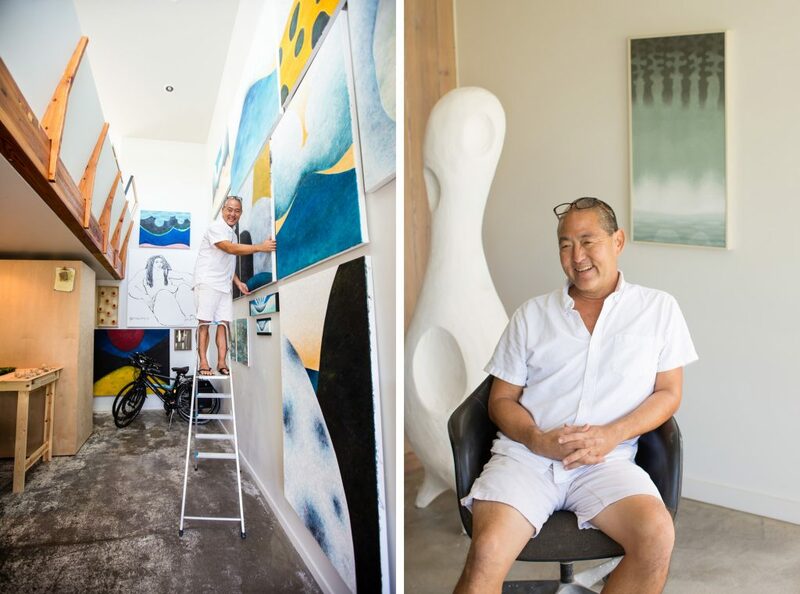 John Koga, born and raised in Manoa, launched his artistic career from Hawaii and is among our island’s most successful modernists. 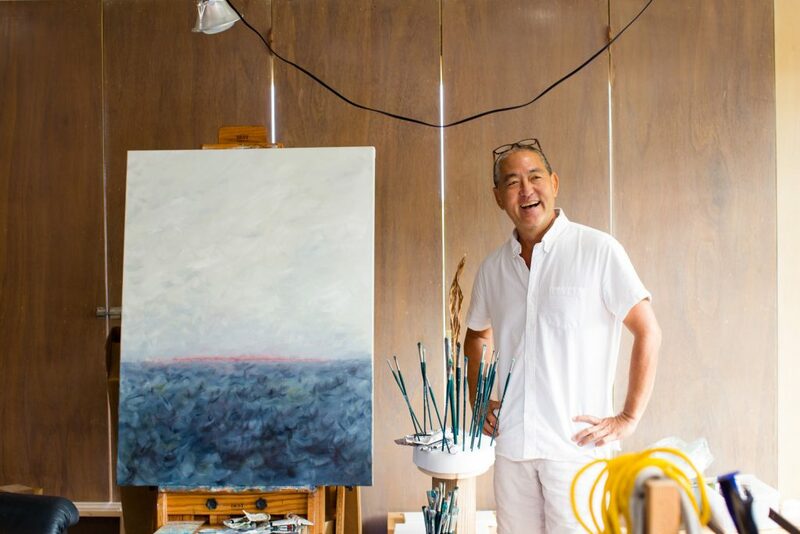 Represented by three galleries – Fine Arts Associates, Cedar Street Galleries and Ralph Pucci International, this versatile artist with abundant talent and enviable tenacity is living his dreams. 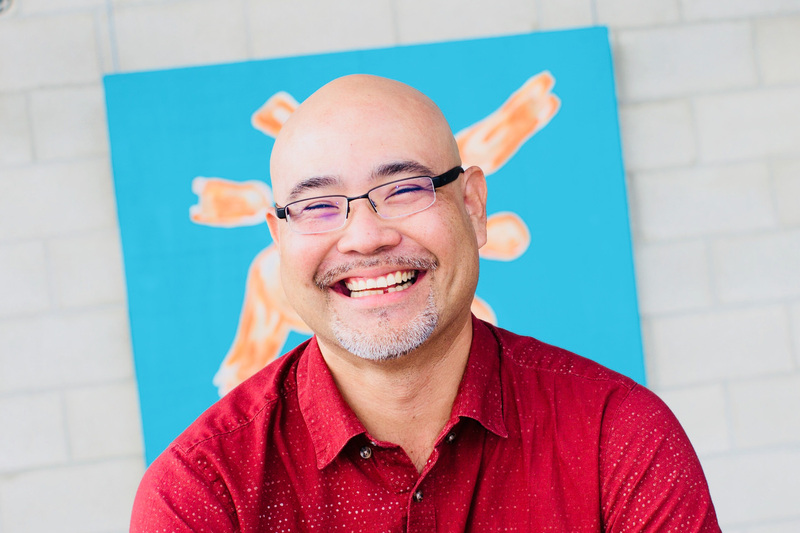 Genuinely humble and enthusiastic, John attributes his incredible mentors’ support, ability to focus, and solution orientation as important factors that contributed to where he is today. Motivated by the desire to express organic, experimental, playful art in a functional, pleasing and balanced format, we learned that he thrives on challenges! Chrissy and I were entertained by John’s stories about obstacles he has faced and the corresponding fixes. The singular question of “Now how do I accomplish this?” plunges John into “the zone” of his artistic process. During our visit, we had the opportunity to glimpse three projects in progress; 1) Maquette for the Waipahu transit station. This project is part of the Honolulu Authority for Rapid Transit (HART) Transit Art Program – public art displayed at the 21 stations along the rail route and at the train control center in Waipahu. 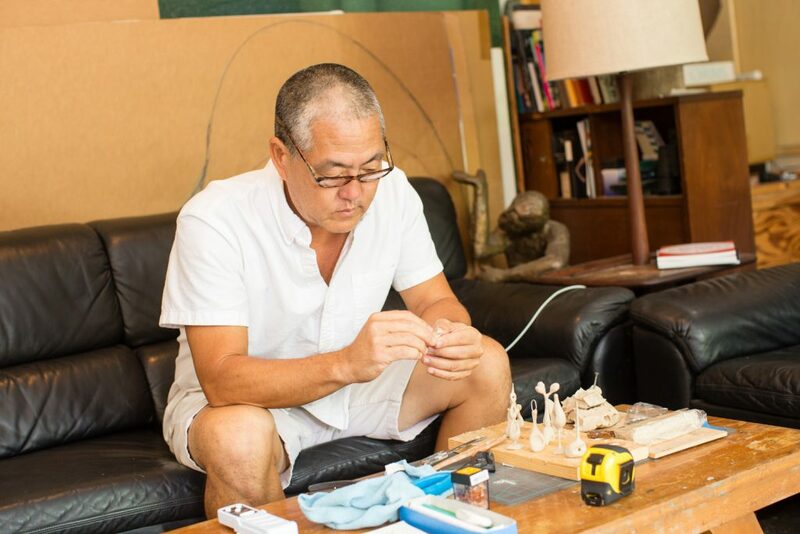 John is collaborating on the design with the Waipahu community to create a three- dimensional sculpture that simultaneously reflects the essence of the surrounding community, honors its history and projects a real sense of its character. 2) A line of custom furniture designs for Ralph Pucci International. Like destiny this opportunity echoes the path artist Isamu Noguchi, a mega inspiration to John, pursued. Noguchi (1904-1988) was a sculptor, painter, ceramicist, furniture and lighting designer – hey wait – sound familiar? John is working on designs for imaginative lamps, chairs, and tables that bring a new harmony of art and furnishings into a home. His goal is functional, vital and stylish furnishings which provide a literal physical interaction/intersection of living + art = living art. 3) Painting – John’s newest medium began about 7 years. True story – all the paintings at his first show sold. 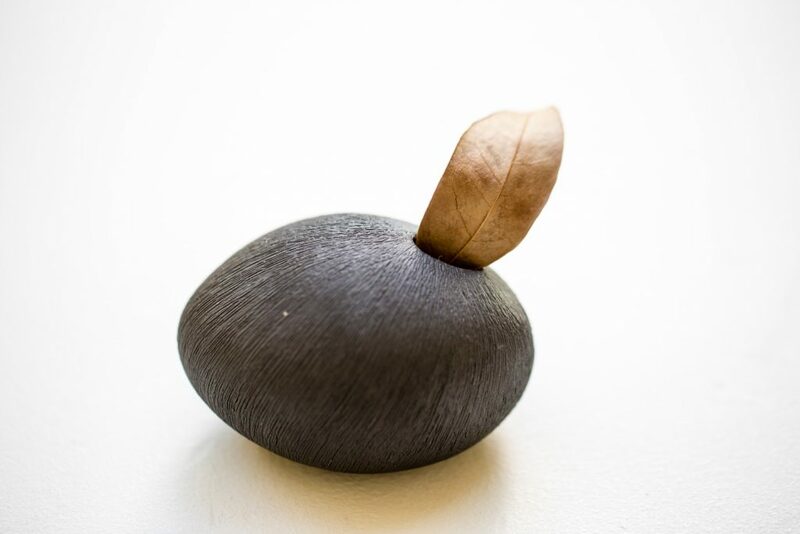 Great encouragement indeed, John is freely exploring this medium and finds it compliments his sculpture work in particular. *From Wikipedia – The Jedi Order mostly consists of polymaths: teachers, philosophers, scientists, engineers, physicians, diplomats and warriors, who value knowledge and wisdom above nationality. By serving others, the Jedi give of themselves through acts of charity, citizenship, and volunteerism.